Think imposing palaces and gigantic forts, and Rajasthan comes to mind. 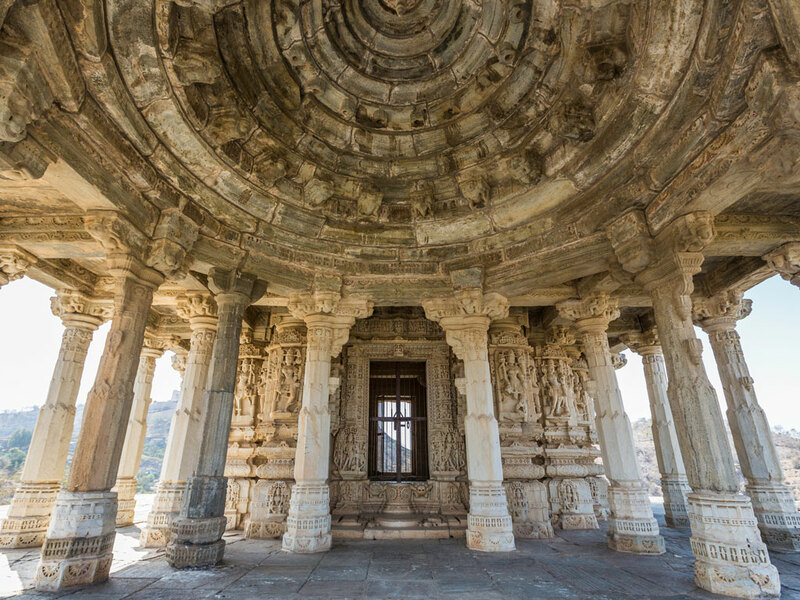 Though Udaipur City Palace, Jaipur’s Hawa Mahal, Jodhpur’s Mehrangarh or the Chittorgarh fort are among the more popular ones, there’s one that deserves equal attention—Kumbhalgarh. This 15th-century fort constructed by Rana Kumbha sits atop a hill in the Aravalli range, having stood the test of time and harsh weather. Heads up: A major chunk of the road of the two-hour journey from Udaipur is quite bad. But if my visit in January is any evidence, the UNESCO World Heritage Site is every bit worth the bumpy ride. Located about 100 kilometres north of Udaipur, the fort is an embodiment of India’s ancient architecture and defence genius. The periphery has cylindrical bastions that snake around the fort complex—for a stunning 36 kilometres. It is said to be the longest wall fortification after The Great Wall of China, which has given it the moniker of India’s Great Wall. While the 13 small hills around the main structure camouflage the otherwise hulking fort until you’re at close range, these battlements can be seen from a good distance while driving up the hill. I cannot locate any official guides—justsome locals who claim to know every inch of the fort. I decide to take a chance. My guide—a tall, lanky man with oil-slicked hair and dizzying enthusiasm—takes me along for an hour-long time warp, after we agree on what I suspect to be an arbitrary amount of Rs 400. He kicks off the tour by telling me that the path on the ramparts is wide enough for eight horses to walk side by side at the same time—built to offer a strategic stronghold in case of an attack. I also learn that the sharp turns inside the fort complex were made to slow down movement in the scenario that the fort’s invaded. This impregnable finesse was achieved under the supervision of one architect Mandan, who was also a theorist and an author in Rana Kumbha’s court. My guide adds that the fort is dear to the Rajputs because it is the birthplace of Maharana Pratap, whose refusal to bow down to the Mughals and bravery at the battle of Haldighati is fondly remembered. Once you enter, you’ll notice that the right side of the complex houses more than 350 Hindu and Jain temples, along with a yajna shala. The Shiva temple is the most visited, significant for the sheer size of the lingam. The temple also saw the death of Rana Kumbha. It is while worshipping Neelkanth Mahadev that his son Udai Singh murdered him in cold blood, to take over Mewar. While the insides are rather simple with sturdy architecture, patches of greenery and open courtyards and terraces, there are some noteworthy structures such as the king and queen’s chambers, the watchtower, the courtyard, the rainwater reservoirs and the cannon room. The courtyard attached to the royal chambers is a good place to sit and take in the fort’s majesty. The royal kitchen once stood close to these chambers, I’m told. To feed the thousands of people who lived inside the fort, a giant kitchen was constructed, complete with stone chimneys. Although apparently segregated into the vegetarian and the non-vegetarian sections, the fact that both kinds were cooked under the same roof is an instance of harmony and tolerance that could be useful today, I think. As you cross the seven pols (doors) that line the entire fort at regular intervals, and ascend to Badal Mahal, an increasingly breath-taking panorama peels off in front of your eyes. At Badal Mahal—the fort’s highest point where the king and queen would catch up over a good view—you’ll be faced with a great vista to the day. Think a bird’s-eye view of the fort and the hills, crawling and winding out to the horizon for as far as your eyes can follow. Certain sections have beautiful elephant carvings, which my guide tells me were painted in natural colours. It is from this spot that the portion of the wall that separates Mewar from Marwar can be seen. Kumbhalgarh has some five ancient cannons on display in an area called the top khana; they clue you into the scale and grandeur of everything, including armoury, during the fort’s heydays. I find myself lingering around, hoping to spot some more artillery, but there’s none in sight. In my three hours inside the complex, I notice that some sections of the fort could do with restoring, but overall it is well maintained. Heading out towards the main gate, my eyes are drawn to the temples I’d passed on my way in, stopping only briefly at the Shiva temple. This time, it was the milky white idol of Lord Parshvanath in one of the Jain temples that left me in awe. I ended my trip by walking on the never-ending wall fortifications. 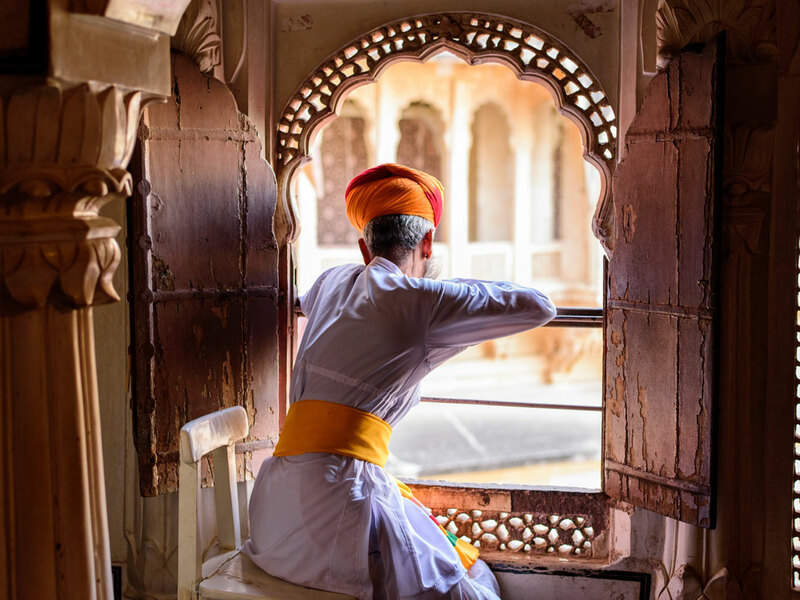 I try to imagine how this place might have been a few centuries ago—the hustle and bustle inside the fort; the luxurious excess; how resilient soldiers must have stood guard in the watchtower; how the greatness and treachery of the nobles shaped this Rajput kingdom.